I’m delighted to learn that we are sending the largest Hong Kong delegation ever to participate in the Asian Games. At last count, some 580 athletes, pretty much evenly divided between men and women, will be competing in 36 sports. I am delighted to see not only many familiar faces here today, but also some new ones who will represent our city this year for the first time. Whatever your sport, your specialisation, I know you will all excel, that you will showcase the Olympic values of Excellence, Friendship and Respect, and more importantly, demonstrate to the world the “Hong Kong spirit”. Apart from cheering for our elite athletes during the games, my Government is committed to promoting a sustainable sporting culture in the community and supporting elite sports. We recently allocated HK$6 billion to the Elite Athletes Development Fund. And to encourage team sports, we launched in January a five-year team sports development programme. Through this initiative, we provide HK$130 million to eight national sports associations, giving them the resources to develop enhanced training programmes for Hong Kong teams competing in this year’s and the 2022 Asian Games. It’s worth noting that the number of fulltime elite athletes at the Hong Kong Sports Institute this fiscal year is about 460, up some 136% in just the past six years. That underscores our commitment to supporting elite athletes. 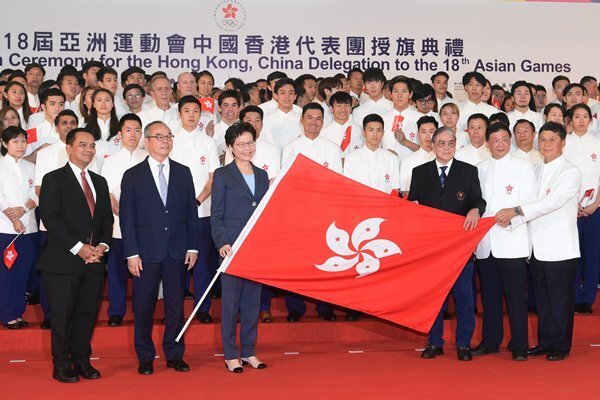 Chief Executive Carrie Lam gave these remarks at the Flag Presentation Ceremony for the Hong Kong, China Delegation to the 18th Asian Games on July 29. There are several reasons I want to come this year. One is really to thank the Asian Youth Orchestra (AYO) for last year’s world tour. Last year’s world tour was part of the Hong Kong Special Administrative Region Government’s celebration of the 20th anniversary of the establishment of the Hong Kong Special Administrative Region. When I was still in the Government as the Chief Secretary for Administration, I thought what a wonderful occasion for us to showcase young musicians in AYO and also for us to demonstrate the powerfulness of friendship in the Asian region to the world, because Hong Kong is Asia’s world city. This is a wonderful place to have this AYO initiative. So last year, with our sponsorship and Cathay’s sponsorship, AYO was able to tour the world, going to places that have not been toured previously including wonderful places like Vienna and places which I don’t understand why you go, that is Toulouse in France, which is very famous for aircraft. I didn’t realise they have also a very nice concert hall that you could perform. So I want to give you a brief summary of the evaluation report submitted to me about our collaboration with AYO last year. These world tour performances have really made us very proud, because they were widely reported in the local newspapers wherever you travelled to and performed and the average attendance in all these world tour concerts was 85%. But actually, for many of the performances, the attendance was 100%. It was a result of the arithmetic as there was one occasion that the attendance was 60%. It’s nothing to do with AYO musicians – must be something to do with the venue. But otherwise I was so delighted to realise that it was 100% in Beijing, it was 100% in American cities and so on. It was very well attended with a very good response even at the very professional level. It’s not only just because a bunch of young people coming they gave you a good response, but they gave you a very good professional appraisal of the very high standards of this youth orchestra. Now, coming back to this year’s tour, it is also very unique because it’s the first time that I read from the brochure that there’s this Guangdong-Hong Kong-Macao Bay Area. This is now such a topical issue in Hong Kong – this is a bay area economy like the Tokyo Bay, San Francisco Bay, and the New York metropolitan area. AYO really catches up with the government work, so there is a tour to three bay area cities including Hong Kong, Zhongshan and Guangzhou. I want again to thank AYO for giving this added value to the AYO’s tour with the inclusion of some of the cities in the bay area. There’s also a further reason that I’ve come, which is to thank AYO for supporting my first official visit to Japan in my capacity as the Chief Executive later this year. This is the biggest official visit of the Chief Executive in 2018. Although I’ve been to Europe in June, actually the destination with the biggest delegation for this year is Tokyo in Japan. Together with the Hong Kong Trade Development Council, we’ll be organising a lot of Think Global, Think Hong Kong promotion activities, conferences, gala dinners and so on. I suddenly had this idea – because if you read the history of AYO there is a very strong Hong Kong-Japan collaboration. If we could bring part of AYO to Japan during my official visit that would be a wonderful thing. I can announce here that during our official visit to Tokyo later this year, and of course with the strong support of Ambassador Matsuda, AYO will do two things for us. About eight AYO musicians from Hong Kong will perform at the gala dinner attended by very important business people in Japan, and on top of that AYO will do a concert in Japan, in Tokyo, bringing together around 30 alumni musicians who have been with AYO previously. They are brought together and these Hong Kong musicians and Japanese musicians with very close bond and friendship will perform for us while we are doing our business promotion in Tokyo. That is a wonderful idea, resembling the spirit of AYO, and also tells this year’s participants that if you do well, we’ll bring you back as alumni for future performances. 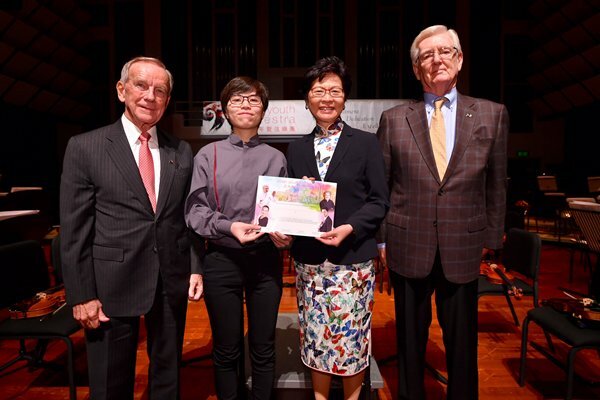 Chief Executive Carrie Lam gave these remarks at the 28th Asian Youth Orchestra Summer Festival & Rehearsal Camp opening ceremony at the Academy for Performing Arts on July 16. The spirit of Rotary (Rotary International District 3450) resonates well with the Hong Kong Special Administrative Region Government’s vision of building a caring and inclusive society in Hong Kong. Poverty alleviation and support for the disadvantaged are among the top priorities on our policy agenda. The recurrent government expenditure on social welfare is expected to reach $79.8 billion in 2018-19, or 55% higher than five years ago. The amount constitutes 19.6% of Government’s total recurrent expenditure, second only to education. According to the latest figures, our recurrent cash policies lifted 360,000 persons out of poverty in 2016 or a reduction of poverty rate by 5.2 percentage points, from 19.9% to 14.7%. In addition, non-recurrent cash benefits such as provision of rates waiver and additional social security payments further reduced the poverty rate to 13.7%, while means-tested in-kind benefits comprising mainly public rental housing lifted an additional 287,300 persons out of poverty and further reduced the poverty rate by 3.3% to 10.4%. Nurturing our next generation is another steadfast commitment of the current-term Government. We are committed to creating more opportunities and providing more support for them to unleash their potential. In doing so, young people will see hope and opportunities for upward mobility. To improve education quality, the current-term Government has pledged to boost recurrent education expenditure by $5 billion, of which $3.6 billion has been approved by the Legislative Council. An additional recurrent expenditure of $2 billion has further been allocated for enhancing the professional development of teachers, strengthening support to kindergartens and promoting integrated education and life-wide learning. 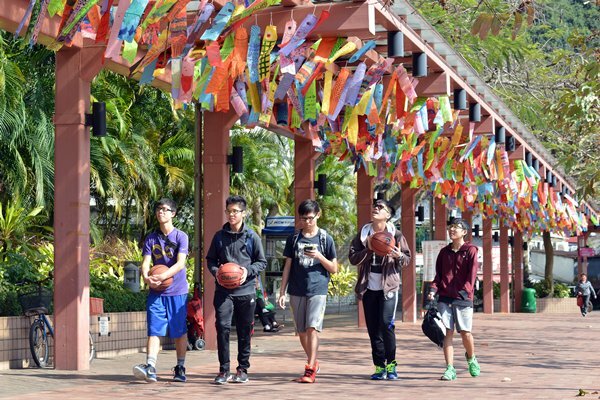 We also provide an average of more than 70,000 annual places for our youth to participate in exchange and internship programmes on the Mainland including the bay area and overseas to broaden their horizon and exposure to work culture in different places. We have also launched two collaboration projects, namely the Future Stars Programme and Life Buddies Mentoring Scheme to encourage businesses and members of the public to become mentors to give inspiration and advice to the younger generation. We have also launched the Youth Hostel Scheme and Space Sharing Scheme for Youth to support young people in pursuing their career and even starting their own businesses. In addition, three new high-level commissions, namely the Commission on Children, Youth Development Commission and Human Resources Planning Commission, have been set up under my chairmanship to oversee holistically key development stages of our next generation, from childhood and youth development to career planning, with a view to helping our young people to chart their way forward and realise fully their potential. I have also set up a steering committee to enhance collaboration within the Government on strengthening support to encourage and facilitate the integration of ethnic minorities into society. We have set aside $500 million for this good cause. However, to enhance the livelihood of our people, Government’s efforts alone are not enough. We need the support of all sectors of the community like Rotary International District 3450 to help create a better place for all. Chief Secretary Matthew Cheung gave these remarks at the Installation Ceremony of Rotary International District 3450 on July 14. Today we celebrate the fifth anniversary of Junior Chamber International Tsuen Wan. In terms of age, the current-term Government under Mrs Carrie Lam, our Chief Executive, is much younger. So we are even more energetic. Since the inauguration a year ago, we have handled together a number of highly politically charged subjects, including the passage of the relevant legislation for the co-location arrangements in connection with the Guangzhou-Shenzhen-Hong Kong Express Rail Link. Despite such controversies, I think most people would agree that our society is moving forward on the right track. I am sure that many of you have also noted the positive changes on various fronts with our new style of governance. In the past year, Hong Kong enjoyed robust economic growth, with a 3.8% increase in real gross domestic product in 2017 being followed by an even higher 4.7% in the first quarter of 2018. All economic indicators in the last couple of months showed that our economic performance remained impressive. While total employment continued to record sturdy growth, the unemployment rate dropped to a 20-year low of 2.8% and people’s earnings registered real improvements in general. Yet, there is no room for complacency. While fortifying the pillar industries of Hong Kong, the current-term Government has been striving to diversify our economy. In this regard, innovation and technology is considered to be the key to the future economic drive. So we have been speeding up the development of innovation and technology in Hong Kong in an unprecedented pace, through diverse means such as investment in infrastructure, collaboration on research and development, nurturing start-ups and promoting the development of industries. From a broader perspective, we are also working in full swing to grasp the vast opportunities presented by the Belt & Road Initiative and the Guangdong-Hong Kong-Macao Bay Area development. On the back of our positive economic outlook, we will make our continued efforts to improve people’s livelihood, covering a wide spectrum of initiatives from improving the teaching and learning environment, relieving the pressure on public hospitals to increasing the provision of elderly care and child care services. Right now, some 60% of our recurrent budget is spent on education, social welfare and medical services. Needless to say, housing has been on the top of our agenda. Last month, the Chief Executive announced a package of housing policy initiatives, pending the conclusion of the public discussion on measures to increase land supply. Please rest assured that we are determined to address the community’s housing need. Turning now to my portfolio which relates to the overall management of the civil service, in order to better equip civil servants to meet rising public expectations, we are planning for a new civil service college. In line with the Government’s population policy, we will soon launch the initiative of allowing serving civil servants who joined the Government between June 2000 and May 2015 to choose to extend their service until 65 (for civilian civil servants) or 60 (for disciplined services). In 2018-19, the civil service establishment is expected to increase by 6,700 posts, or about 3.7%, the highest year-on-year increase since reunification. The strengthened manpower could hopefully enhance the delivery of public services while relieving the work pressure of our civil servants. Young people are our future. In line with the “we care, we listen, we act” approach, the current-term Government has put much emphasis on intensifying our connection with young people. Our objective is very clear, that is to give specific attention to issues on youth education, career pursuit and home ownership as well as the participation of young people in politics and their engagement in public policy discussion and debate. In this respect, we have established a high-level Youth Development Commission chaired by the Chief Secretary to enhance policy co-ordination within the Government. This will enable holistic and more effective discussion on issues of concern to our young people. We have also introduced and subsequently formalised the Pilot Member Self-recommendation Scheme for Youth for civic-minded young people to serve on advisory boards or committees so that their voices could be more directly heard. The Policy Innovation & Co-ordination Office, which is re-organised from the former Central Policy Unit, has also recruited about 20 young people aspiring to pursue a career in policy research so that they can gain experience in public administration. In charting the future of Hong Kong, we need your staunch support. We also welcome very much your views, for example in the ongoing consultation for the 2018 Policy Address, so that we could shape our policies having due regard to the youth dimension. You may even consider playing your part in the government machinery as a way to serve the community. As I just mentioned, there will be thousands of civil service posts on offer. Let me call upon all of you to work together for the betterment of Hong Kong. Secretary for the Civil Service Joshua Law gave these remarks at the Junior Chamber International Tsuen Wan 5th Anniversary Dinner on July 14. France is Hong Kong’s third largest merchandise trade partner within the European Union. Last year, our bilateral merchandise trade totalled nearly $87 billion, or an increase of nearly 14% over 2016. Turning to investment, French inward direct investment into Hong Kong stood at $77 billion at the end of 2016. French companies in Hong Kong flourish and thrive. Eight-hundred French companies count Hong Kong as home and about 170 of them choose Hong Kong as their regional headquarters or offices. The close and lasting bond between Hong Kong and France explains why our Chief Executive Carrie Lam spent a highly productive but hectic week in France just last month. Her schedule took her to Bordeaux, one of the world’s most renowned wine-and-dine cities, to witness the signing of a memorandum of understanding between the Hong Kong Tourism Board and their counterparts of the Bordeaux Metropole. The agreement will no doubt boost bilateral co-operation in wine and food tourism and at the same time expand wine education and manpower training between the two places. I must hasten to add that our wine imports from France exceeded $7 billion in 2017 or a nearly 700% increase over the past decade. What is more exciting is that France captured a nearly 60% share of our total wine imports last year. During her visit in France, the Chief Executive visited the headquarters of Airbus Helicopters outside Marseille to accept three brand-new H-175 helicopters on behalf of our Government Flying Service. We are expecting another four new helicopters to be delivered by the end of this year. These new helicopters are indeed a testimony of the successful East-West co-operation since our motherland contributed to the airframe manufacturing even though the production was mainly undertaken by Airbus Helicopters. Flying down to Paris, the Chief Executive witnessed the signing of a co-operation agreement between the Hong Kong Science & Technology Park, the University of Hong Kong and Institut Pasteur. We have enjoyed a long and rewarding collaboration with Institut Pasteur, including the HKU-Pasteur Research Pole which specialises in the study of infectious diseases. We are hopeful that the Institut will expand its R&D in Hong Kong, in areas ranging from healthcare technology to artificial intelligence and robotics. In parallel, the Hong Kong Special Administrative Region Government has set aside funds for two major research clusters: one focused on healthcare technology and the other on AI and robotics. We will continue to promote innovation and technology development in Hong Kong, with a view to attracting world-class scientific research institutions and technology companies to Asia’s world city. The Guangdong-Hong Kong-Macao Bay Area in which Hong Kong will play a key role is destined to rise as Asia’s Silicon Valley. The city cluster, covering Hong Kong, Macau and nine prosperous Guangdong cities, will leverage on the unique strengths and advantages of each partner city, and boasts a GDP of US$1.5 trillion and a population of 68 million spread over 56,000 square kilometres. Hong Kong and Shenzhen are already working on an outsized technology park at full steam. Located close to the boundary with Shenzhen, the 87-hectare park will open in phases, beginning in 2022. Once it is up and running, it is expected to inject more than US$7 billion a year into Hong Kong’s economy. Beyond technology, the bay area will count on Hong Kong’s financial services capacity to power business opportunities. Our motherland’s far-reaching Belt & Road Initiative will create enormous opportunities for our next generation. As a leading international financial and services hub, Hong Kong has the talent, the experience and the connections to bring multinational partners together and ensure both project financing and implementation. French expertise is most welcome to partner with Hong Kong to seize the vast opportunities that the bay area and the Belt & Road Initiative will offer us. I can reassure our friends from France they will certainly feel very much at home in Hong Kong. Our French community amounts to 25,000 French nationals, forming a unique “mini-France” in our city landscape. They may initially be attracted by the business opportunities, but they stay for the lifestyle and the confidence they have in Hong Kong. There is good reason for both. Based on 148,000 interviews with adults in 142 countries and areas, Gallup’s 2018 Global Law & Order Report ranked Hong Kong third in the world as the city “most likely to feel safe in”. When it comes to lifestyle, Hong Kong is blessed with Le French May, one of the largest annual events on Asia’s cultural calendar, and Le French GourMay, a food and wine festival perfectly attuned to the cosmopolitan hearts and appetites of Asia’s world city. 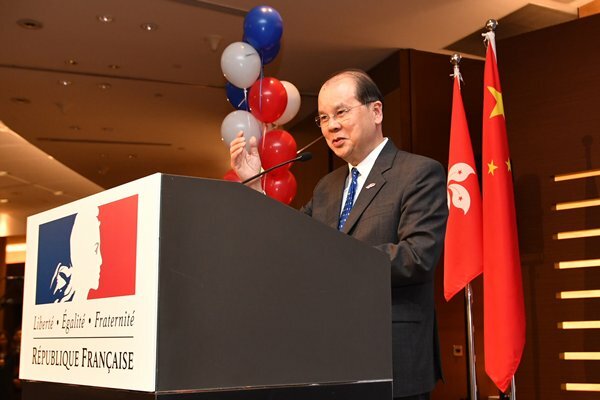 Chief Secretary Matthew Cheung made these remarks at the French National Day 2018 reception on July 13. I notice that the theme of today’s conference is Leadership in an Age of Disruption. It is very timely because just 24 hours ago the law and order on the multilateral trade system and the economic globalisation have been disrupted by one single country. I am not going to talk about this trade war, except to assure you that Hong Kong will stay alert to assess the implications arising from the trade war, the sanctions, the tariff increases and so on, and get ourselves ready if there are things that the Government could do. But it does remind me of a statement, a very powerful statement, made by President Xi Jinping at an international forum. He said of course you could close the door in order to keep the wind and the rain away, but by closing the door you are also denying the people in the room of air and sunshine. The implications are something that we should all ponder on. Coming back to Hong Kong, I have been in the Government for 38 years now, so you would have imagined for somebody like myself, who has been in senior executive positions for quite some time, that the Government would be willing to send me to some MBA programme, either in this very illustrious Executive MBA programme of Kellogg and HKUST or the Sloan programme, to which the Government is still sending senior colleagues, or the Harvard Business School programme, but unfortunately I have attended none of these programmes. I am more or less a self-made senior executive or leader. So I am going to spend the next few minutes to share with you my experience, or how I sort of nurtured myself to become a senior executive without the benefit of the MBA programmes, especially now that I am in the position of the Chief Executive of Hong Kong. As you know, I have just finished my first year in office and when I started this job, the first thing as a leader is you need to have a vision for Hong Kong, just like all of you who are in key businesses, you need to have a vision for your corporation. My vision for Hong Kong is very simple. It is for a Hong Kong of hope and happiness, a city that we are proud to call our home – a vibrant international metropolis that is just, civilised, safe, affluent, enjoys the rule of law, compassionate, and well governed. But these words are easier said than done. In order to achieve that vision, I have derived or designed for myself and my team what I call a new governance style, new government roles, and a new fiscal philosophy. Having been in the job for one year, let me share with you a few concrete examples of what I mean by these three new things. On the new governance style, for my team, when we first started off, I have to align our style to be one which is caring, willing to listen and determined to act. There is no point to care and to listen but not willing to act. So “action-oriented” sort of describes my Government in the first year of office. At the same time, we adopt features of being innovative, interactive, and collaborative, because nowadays, especially in the public sector, issues are very complicated. There is no issue which is neatly and nicely within one bureau or one department. There are many cross-bureau and cross-departmental issues that we need to address and solve for the people of Hong Kong. Take for (example) housing, housing is not just an issue for the Transport & Housing Bureau. Housing requires land, so I need to bring in the Development Bureau to work with the Transport & Housing Bureau to jointly address the housing issue in Hong Kong. Take another example, we want to provide better care for young kids, normally within the age of two to four, who are suffering from developmental delays or autism. And this is really a cross-bureau initiative between the Education Bureau, the Social Welfare Department and also the Health Department. And as a result of that, we rolled out a very encouraging programme to deliver services, that is early rehabilitation services, to kindergartens where these kids are, so that they can receive rehabilitation service at an early juncture. This is the result of three bureaus and several departments working in concert. As far as government facilitation is concerned, for example, we now provide one-stop service for innovative projects that the project proponents are not sure where to go to get some government advice. Similarly, for innovation, we want more innovation in the Government, but where is that drive for policy innovation? So I have created a little unit called the Policy Innovation & Co-ordination Office to provide the first-stop and one-stop service for innovative projects from the private sector and from the non-governmental organisations, so that we can take forward those projects within the Government. Similarly, in terms of facilitation such as in the building, lands and planning aspects, to facilitate the building process, we also need to do more facilitation. I can go on and go on about the examples on where Government could perform a facilitating role in order to enhance our competitiveness, but it is in the role of promoter that I find it most gratifying. In my first year of office, I have made a total of 22 trips outside of Hong Kong, so about 20% of my time as the Chief Executive was actually spent outside of Hong Kong, both in the Mainland – Beijing and other cities – as well as abroad. And I have attended four international conferences already by now, including the APEC Economic Leaders’ Meeting, the Davos World Economic Forum, the Boao Asian Forum and the ESCAP of the United Nations. On every occasion, I promote Hong Kong, naturally, and talk about Hong Kong’s unique advantages under “one country, two systems”, and also try to dispel any misperceptions about the relationship between this Hong Kong Special Administrative Region and the Central Government. This promotion role is very satisfying, because normally it’s not just going to talk. We could identify opportunities for collaboration, particularly in the area of innovation and technology because many people outside of Hong Kong will never associate Hong Kong with I&T. Yes, Hong Kong is a very international financial centre, a very important business hub, a good place to visit, but science and technology seems to be quite far away from Hong Kong. One year down the road I have to say that we are now getting a little bit of reputation and have the aspiration and the ambition to become an international I&T hub. Two weeks ago in Paris, we sealed off a co-operation arrangement with Institut Pasteur, which is a very famous research institute focusing on vaccines, and Institut Pasteur will collaborate with the Hong Kong University medical school to set up a centre in the Science Park as part of our critical mass or cluster on health technology for Hong Kong. On the new fiscal philosophy, it is even more tangible, because it is talking about money. I have a very different concept about money, especially public money. I said that spending is not quite spending – you can regard it as investment. It does yield return. Building the HKUST is a great return for the community. Of course the money came mainly from the Hong Kong Jockey Club then, but it’s a great return for this city and for our younger generation. So the first policy area that I spent was on education. I put in $5 billion extra recurrent expenditure, now raised to $7 billion recurrent expenditure, for education, all the way from kindergarten education to higher education, and with a bit of luck, I’ll be able to get about $11 billion capital expenditure for the universities to build hostels. So keep up your lobbying, Professor Shyy Wei, with the Legislative Council members so that I could get it before the summer recess and you can start to build your hostels in order to welcome more international students as well as to meet the needs of local students for hostel life. And likewise, on the revenue side, revenue is to help us to sustain the Government’s expenditure. But revenue, especially in tax, is also a very good instrument to achieve economic and social objectives. So, within the period of one year, we have introduced two tax concessions. One is to replace the flat rate 16.5% for profits tax by a two-tier profits tax regime – for the first HK$2 million profit we are charging only half of the 16.5%, that is 8.25%, which is very good for startups and SMEs in Hong Kong. The second tax concession which is waiting for the Legislative Council to approve is tax deduction, a super tax deduction for private corporations’ expenditure on research and development. For the first time in our tax history, we are giving super tax deduction, that is, we will give you a deduction more than you have actually spent. For the first $2 million of R&D expenditure by corporations, we will give a 300% tax deduction. Beyond the $2 million, it will be a 200% deduction and there is no upper limit to how much you will benefit under this tax concession. On the economic side, we want to promote and develop the bond market. The Financial Secretary has introduced a couple of initiatives to give subsidy and grants to attract bond issuance to Hong Kong, especially green bond. We are going to provide some subsidy to defray the expenses to get certification from the Hong Kong Quality Assurance Agency Green Finance Certification Scheme. These are some of the examples to demonstrate to you that when we said we have a new governance style and we want to play some new roles and practise a new fiscal philosophy. A lot of those ideas have been put into action in the last 12 months, and we will continue to do so in the remainder of our term because I am extremely confident and optimistic about Hong Kong. In fact, to be a senior executive or leader, whether in the public sector or in a corporation, you have to be very optimistic, you have to be very confident in order to lead your team. In a way I would describe my role also as a cheerleader. 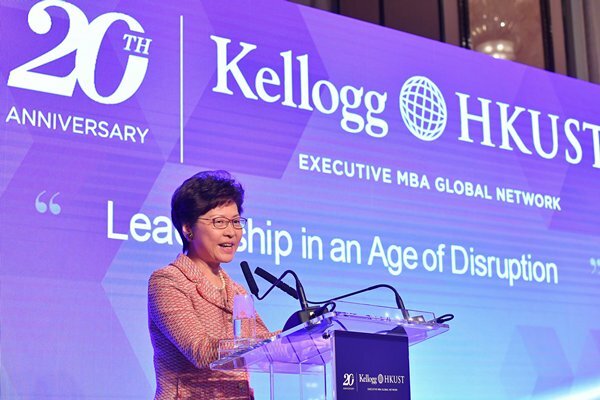 Chief Executive Carrie Lam gave these remarks at the Kellogg-HKUST Executive MBA 20th Anniversary Management Conference on July 7. It was 20 years ago this very day that Cathay Pacific flight CX889, from New York, became the first commercial service to touch down at our brand-new airport. That was the beginning of our steep climb, our rise and shine as one of the world’s major aviation hubs. The numbers certainly bear that out. In 1997, its last full year of service, Kai Tak Airport handled 10.2 million passengers. Last year, Hong Kong International Airport, or Chek Lap Kok, welcomed 73 million passengers and more than five million tonnes of air cargo. That makes us the world’s third-busiest international passenger airport. It also makes us the world’s busiest cargo airport – and that for the past eight years in a row. We’ve become just as popular with the world’s airlines. The number of airlines with operations here has grown from 60 to more than 100, providing over 1,100 flights a day to more than 220 destinations around the world. Such results have not gone unnoticed. Over the past two decades, the airport has been honoured with more than 70 “best airport” awards. And the best is yet to come. Construction of the airport’s three-runway system has been in place for nearly two years now, with completion scheduled for 2024. At that point, the airport will be able to welcome about 100 million passengers a year while handling nine million tonnes of cargo annually. This timing should be fortuitous, given the vast promise of the Guangdong-Hong Kong-Macao Bay Area, with its collective population of over 69 million busy, prosperous people. The imminent completion of the Hong Kong-Zhuhai-Macao Bridge and the Hong Kong section of the Guangzhou-Shenzhen-Hong Kong Express Rail Link will slash travelling time between Hong Kong and Guangdong as well as Macau, making our airport even more accessible. The major Pearl River Delta airports are also expanding to cater to the expected soaring of demand, but I am confident our integrated multi-modal infrastructure – embracing air, sea and land – will ensure Hong Kong remains the bay area’s international transport hub. More than moving people and cargo around the region and the world, our airport will fly on sustainable talent. In that regard, I’m pleased to note that the Airport Authority and France’s Groupe ADP last month signed two MOUs. These will boost co-operation between Hong Kong International Airport and Paris Charles de Gaulle Airport, one of the world’s busiest airports. These agreements cover a variety of areas, ranging from airport management to talent development, including a staff exchange programme. I’m pleased as well that our International Aviation Academy and the Vocational Training Council also signed an agreement last month. Together, they will work to expand our local talent base, training tomorrow’s professionals to support the airport’s long-term development. Going further, the academy will also offer training and exchange opportunities to our friends along the Belt & Road, sharing Hong Kong’s rich experience in aviation and strengthening people to people bonds. Hong Kong International Airport is among our most important infrastructure. My heartfelt congratulations to Hong Kong International Airport on its 20th anniversary, and I wish it all the best in the next 20 years. 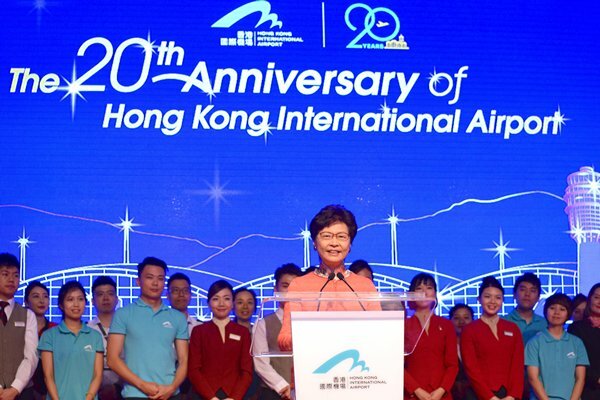 Chief Executive Carrie Lam gave this speech at the cocktail reception in celebration of the 20th anniversary of the Hong Kong International Airport on July 6. It is clear that the world’s interest in connectivity is rising. APEC, ASEAN, the G20 and the European Union have all placed connectivity on their agenda, and for good reason. Enhancing connectivity is a key to unlock many opportunities, as it smooths the flow of technology and ideas, enhances the mobility of labour and capital, lowers trade costs, and expands global access to resources. A 2013 report from the World Economic Forum, “Enabling Trade, Valuing Growth Opportunities”, suggested that global GDP could increase by US$2.6 trillion if all economies managed to reduce border administration procedures and improve infrastructure just halfway to global best-practice levels. Alongside the outsized rewards of connectivity, a more connected world also creates considerable challenges. Environmental pollution, loss of biological and cultural diversity, exploitation of workers, worsening inequality, systemic financial crises, to name but a few, have become facts of life in our increasingly connected world. As the Chief Executive, I can assure you that Hong Kong is responding to those growing concerns. For the next few minutes, I’d like to focus on three areas: green finance, anti-corruption and dispute resolution. The Paris Agreement, which comes into force in 2020, is spurring institutional investors to integrate environmental considerations into their investment portfolios. And green finance has gained fresh momentum thanks to the G20, which, under China’s Presidency, established the Green Finance Study Group. Not surprisingly, global demand for green financial products is rising rapidly, with green bonds by far the most prevalent worldwide. In the first quarter, sovereign issuances in particular played a critical role in the green bond market, accounting for about one third of issuances in both developed and emerging markets. The annual green bond issuance in 2017 alone grew well over 80%, attracting many jurisdictions to the flourishing green finance market. My Government is no exception. We are fully committed to Hong Kong’s rise as a green finance hub, with a keen interest in the markets within the Guangdong-Hong Kong-Macao Bay Area and the economies along the Belt & Road. We are also developing local expertise in green finance certification services. Just last month, we launched a Green Bond Grant Scheme to stimulate the development of green finance. It subsidises eligible green bond issuers in obtaining certification under our local Green Finance Certification Scheme. We also plan to offer a Government Green Bond Programme with a borrowing ceiling of US$12.8 billion (HK$100 billion) to finance government projects with environmental benefits. It would become one of the world’s largest, if not the largest, sovereign green bond issuance. At the same time, we will explore other opportunities that position Hong Kong as a regional hub for green finance. More than a green environment, we need a clean community if we are to remain a prosperous economy through this 21st century. Corruption stifles free and fair competition. It also leads to uncertainty regarding economic transactions, which only serves to dampen investment. Corruption, in short, is a major hurdle to sustainable development. To be sure, this was not always the case. Indeed, Hong Kong was riddled with corruption until the establishment of the Independent Commission Against Corruption, or the ICAC, in 1974. The importance of the ICAC is underpinned by the Basic Law, Hong Kong’s mini-constitution. The Basic Law states that the ICAC will function independently and be accountable to the Chief Executive of Hong Kong. The ICAC’s effectiveness is recognised internationally. Hong Kong, after all, is consistently ranked among the least-corrupt places in the world. In Transparency International’s latest Corruption Perceptions Index, Hong Kong rose from 15th least-corrupt place in 2016 to 13th last year. That’s on par with Australia and Iceland, and ahead of such advanced nations as Austria, Belgium, the US and Japan. The ICAC, which enjoys both structural and operational autonomy, has been cited as one of the world’s “best-known specialised anti-corruption institutions” by the OECD (The Organisation for Economic Co-operation & Development). The OECD also reported that many countries, “inspired by the success story of Hong Kong’s anti-corruption commission and its three-pronged approach to fighting corruption”, have established their own specialised, anti-corruption bodies. Hong Kong, I should add, is a member of the Anti-corruption Initiative for Asia & the Pacific, led by the Asian Development Bank and the OECD. We have endorsed the initiative’s Anti-Corruption Action Plan for Asia & the Pacific, and we will continue to work closely with its counterparts around the world. In a more connected world, the flow of people and trade soars and with it the opportunities for cross-border business. That in turn increases the possibilities of disagreements, including disputes between the rights of a foreign investor and the freedom of a state to protect its environment. Today, a multi-tier dispute-resolution clause is quite common in investment treaties, with mediation as an intermediate stage and arbitration as the last resort in resolving investor-state disputes. In such cases, both the foreign investor and the state prefer a neutral place of arbitration. That is because of the perceived bias if the proceedings are conducted either in the foreign investor’s country or the host state. To that, I say: Welcome to Hong Kong. We offer numerous advantages as a neutral venue for dispute resolution. Let me note several of these now. To start with, our well-developed legal system is rooted in the common law, which has been practiced here for more than 150 years. It’s familiar to the international community, providing sound legal protection for investments and property ownership, as well as a dispute-resolution regime of international standards. Our judiciary is independent and well respected, ensuring that it is both mediation- and arbitration-friendly. Eminent jurists from other common law jurisdictions may be appointed to our Court of Final Appeal as non-permanent judges. Recent examples include the Right Honourable the Baroness Brenda Hale of Richmond, President of the UK’s Supreme Court, and the Right Honourable Beverley McLachlin, former Chief Justice of Canada. Then there’s our substantive pool of independent local and overseas legal professionals. They bring us international perspective, multilingual capabilities and extensive experience in handling cross-border transactions of all kinds. Our mediation regime strengthens people-to-people connectivity. We have dedicated mediation legislation and an industry-led accreditation body for mediators. Its disciplinary functions ensure the quality of mediators and consistency in training and accreditation standards. It also boosts public confidence in our mediation services. And, given our location at the southern gateway of Mainland China, in the heart of Asia and within a five-hour flight radius of half the world’s population, Hong Kong serves as a central bridge between the Mainland and the rest of the world. It helps too, that our heritage and the culture influences that continue to shape us today are a welcome fusion of East and West. Riding on the above advantages, Hong Kong is uniquely positioned as a deal maker and dispute resolver through the provision of our professional services, which are aligned with global best practices. To enhance our status as a leading centre of international legal and dispute resolution services in the Asia-Pacific region, my Government has formulated a steadfast policy to promote our services at the international level. In particular, to cater for the growth of commercial activities brought about by the Belt & Road Initiative which entails an increasing demand for a fair, effective and efficient international dispute resolution mechanism, the legal profession and the dispute resolution professional sector, with the policy support of the Government, are actively establishing an online dispute resolution platform. This initiative seeks to make use of innovative technology to provide a safe, reliable and credible platform to provide enterprises in various economies along the Belt & Road with convenient and cost-effective online dispute resolution. Let me add that, a year ago, Hong Kong signed the Framework Agreement on Deepening Guangdong-Hong Kong-Macao Cooperation in the Development of the Bay Area. Then, last December, we signed the Arrangement between the National Development & Reform Commission & the HKSAR Government for Advancing Hong Kong’s Full Participation in & Contribution to the Belt & Road Initiative. Both agreements contain explicit reference to reinforcing Hong Kong’s status as a regional hub for international legal and dispute resolution services. The Belt & Road Initiative is an inclusive and truly global initiative. Some 80 countries and international organisations spanning Asia, Europe and Africa are committed to the ambitious plan. To date, more than 270 agreements or deliverables have been entered into among the economies along the Belt & Road corridors. These projects are transnational, huge in scale and complex in their needs and goals. They range from finance, infrastructure and trade and commerce, to information technology and digital development. They also embrace sectors ranging from agriculture and healthcare to environmental protection and conservation. To fully capitalise on the vast promise of the Belt & Road Initiative, we must ensure that its connectivity is wholly sustainable, built to last, and engineered to flourish. 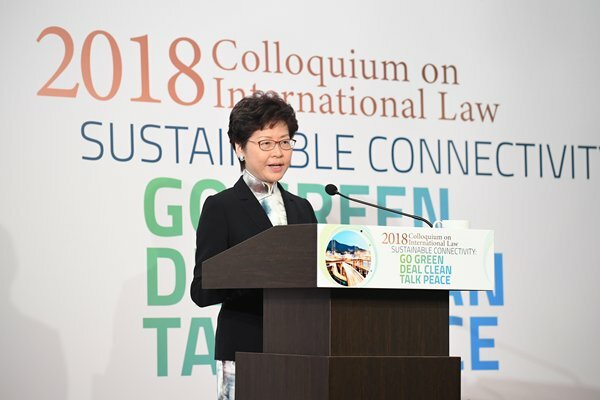 Chief Executive Carrie Lam made these remarks at the 2018 Colloquium on International Law on July 6. We are all here to celebrate the 242nd birthday of the US. We are here as well to champion the longstanding ties that connect Hong Kong and the US, as this year marks the 175th anniversary of the US’ diplomatic presence in Hong Kong. My thanks to the Consul General for making clear just how valued our diplomatic ties have been, and how important they continue to be for both sides. The numbers certainly underline that. Last year, our bilateral merchandise trade came in at nearly US$70 billion, up 2.5% over 2016 totals. The US was our second-largest export market in 2017, behind only Mainland China. Hong Kong, meanwhile, was the US’ ninth-largest export market. Let me add that the US enjoyed a merchandise trade surplus with Hong Kong of US$32.8 billion. That was the highest trade surplus the US enjoyed with any single economy. And you will be interested to know that I actually mentioned this figure to President Donald Trump when we met at APEC meetings last November in Vietnam. Though I cannot be sure, apparently he was pleased. Among the commodities, we are particularly keen on meat and other agricultural products. In 2016, Hong Kong was the fifth-largest market for US beef and veal exports – and your sixth-largest market for agricultural products in general. We are definitely not complaining about our trade deficit with America. Hong Kong always believes in free trade and we have become one of the world’s largest trading economies because of free trade. In fact, the Washington-based Heritage Foundation has named Hong Kong the world’s freest economy for the past 24 years in a row. 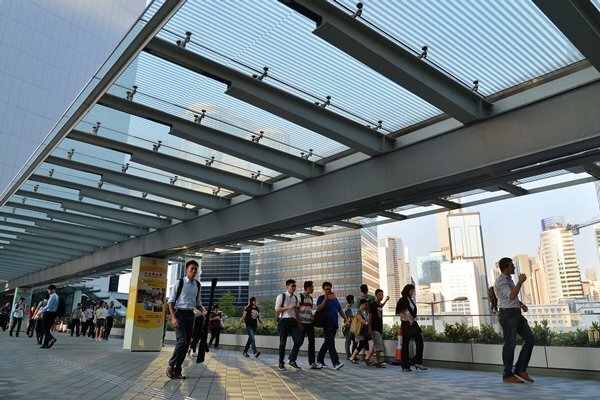 Hong Kong was also named the world’s second-most competitive economy this year by the Swiss-based International Institute for Management Development, having occupied the first position for the two preceding years. I should add that this year, the first place went to the US. And the World Bank has recognised Hong Kong as the World’s fifth-easiest place to do business. The free flow of capital, information and people has earned us our international reputation, and will surely frame our future success, alongside our unique advantage under “one country, two systems”, our status as an international financial centre and the gateway to the Mainland of China, our enduring embrace of the rule of law, our world-class logistics and communications infrastructure, our level playing field for business and our low and competitive tax regime. American business certainly believes in Hong Kong. More than 1,400 US companies operate in Hong Kong, and I understand that over half of them have actually chosen to set up their regional headquarters or regional offices here. They are certainly well taken care of here by the American Chamber of Commerce in Hong Kong. I am particularly grateful to AmCham’s annual Washington Doorknock event, which is helpful in making the case for Hong Kong. Beyond business, we have a long-standing and cordial relationship at government level through strong and valuable enforcement co-operation on various fronts, including counter-terrorism, money-laundering, drug-trafficking and strategic trade controls. Our co-operation is broad, effective, and mutually beneficial. I am also grateful to the 100,000 US citizens living in Hong Kong for bringing the much loved US culture, creativity and dynamism to our city. Despite our close ties, from time to time Hong Kong and America do have different views on matters. I would say that this is most natural in today’s sophisticated and constantly changing world. However, I do think and believe you would all agree that we have much more in common than our differences, and there is much room in various areas for us to strengthen our mutually beneficial relationship. We look forward to working with all of you here to maximise our common ground, and build even stronger ties between the two economies in the years to come. 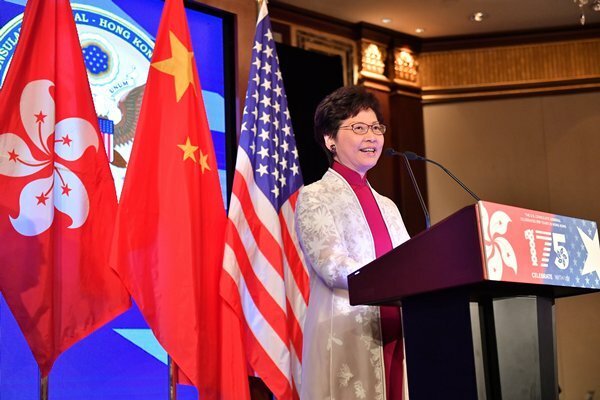 Chief Executive Carrie Lam gave this speech at the US Independence Day reception on July 5. It is with gratitude that I join you here today to celebrate the 21st anniversary of the establishment of the Hong Kong Special Administrative Region (SAR) of the People’s Republic of China. A year ago, President Xi Jinping visited Hong Kong to grace our celebration of the 20th anniversary of Hong Kong’s return to the motherland with his presence, and administered the oath of office for me and the principal officials of the fifth-term Government. During his three-day visit, President Xi expressed cordial care for Hong Kong and gave four imperatives (Note 1), which has created the exceptionally favourable ground for the current-term Government to govern Hong Kong in accordance with the law, assume a proactive role, develop the economy and improve people’s livelihood. During the past year, the SAR Government upheld the principle of “one country” by maintaining an absolutely clear stance when it comes to black and white issues and showing no tolerance for any act that would hit our country’s bottom line. Without fear, we took right actions over our relationship with the Central People’s Government, and enhanced the public’s understanding of the constitution, the Basic Law, as well as national security. Meanwhile, we made good use of the advantage of “two systems”. With the staunch support of our country, we actively participated in the Belt & Road Initiative (Note 2) and planned for the Guangdong-Hong Kong-Macao Bay Area in collaboration with the Guangdong and Macau governments. I for my part conducted frequent duty visits (Note 3) to strengthen Hong Kong’s external ties and promote Hong Kong’s international status. In my speech at the inauguration ceremony on July 1 last year, I said that “hope propels a society forward, and confidence is the foundation of hope.” To be even clearer, I said that we had no reason to lose confidence if we looked closely and rationally at what we had achieved over the past two decades since our return to the motherland. After a year of leading the Government to demonstrate a new style of governance, perform new roles and implement a new fiscal philosophy, I have even greater confidence in Hong Kong. As long as we remain focused and stand united, I am sure that the best is yet to come for Hong Kong. Over the past year, Hong Kong enjoyed robust economic growth, with a 3.8% increase in real Gross Domestic Product (GDP) in 2017 being followed by an even higher 4.7% in the first quarter of 2018. All economic indicators in the last couple of months showed that our economic performance remained impressive. While total employment continued to record sturdy growth, the unemployment rate dropped to a 20-year low of 2.8% and people’s earnings registered real improvements in general. Hong Kong has also remained one of the safest cities in the world, with the overall crime rate down by 8.2% year-on-year in the first four months of 2018, a new low since 1971. Economic growth provides us with the necessary resources for the continuous improvement of people’s livelihood. The first budget of the current-term Government has allowed for a total expenditure of $569.6 billion, accounting for 20.2% of GDP and representing a significant year-on-year increase of 12.3% in recurrent expenditure. The provision will enable the steady and sustainable delivery of our work in improving the teaching and learning environment, relieving the pressure on public hospitals, and increasing the provision of elderly care and child care services. Housing remains our number one social concern. The housing policy measures I announced two days ago cannot immediately increase housing supply, or effectively curb the rise in property prices. However, they demonstrate the SAR Government’s political determination and innovative thinking. We hope that as a result, public discussion on land supply can be more focused, and citizens can expect that increasing land supply will offer opportunities for purchasing affordable homes and shorten the waiting time for improving their living conditions. Allow me to quote from a Chinese poem: “Slipping into the night with the breeze, the rain moistens everything in silence”. It aptly describes the “we care”, “we listen” and “we act” approach sincerely adopted by the current-term Government, which has brought about relative stability in society, restored room for rational discussion rather than personal attacks in the Legislative Council, and rebuilt public trust in the Government. We have also adopted specific policies and measures to provide young people with more opportunities so that they can take up internships in the Mainland for deeper understanding of our national developments and participate in the SAR’s affairs. For quite a period of time, I always heard people describing this term of Government as having “a good start”. The good start is in fact strongly supported by the Central Government and underpinned by mutual respect and understanding, as well as joint efforts of different sectors. To sustain the situation, we must never forget our aspiration for the full and faithful implementation of “one country, two systems”; we must maintain our confidence in the rule of law and unique advantages of the SAR; and we must keep our patience in nurturing young people into a new generation with a sense of national identity, an affection for Hong Kong and an international perspective, who are also passionate about and committed to the well-being of our community. President Xi Jinping has pointed out that, for better implementation of “one country, two systems” in future, (1) it is imperative to have a correct understanding of the relationship between “one country” and “two systems”; (2) it is imperative to always act in accordance with the constitution and the Basic Law; (3) it is imperative to always focus on development as the top priority; and (4) it is imperative to always maintain a harmonious and stable social environment. In December 2017, the SAR Government and the National Development & Reform Commission (NDRC) signed the arrangement between the NDRC and the Government of the Hong Kong SAR for Advancing Hong Kong’s Full Participation in and Contribution to the Belt & Road Initiative. The first Belt & Road Joint Conference was held in Beijing in June 2018. On February 3, 2018, the SAR Government held a seminar entitled “Strategies & Opportunities under the Belt & Road Initiative – Leveraging Hong Kong’s Advantages, Meeting the Country’s Needs” in conjunction with the Belt & Road General Chamber of Commerce at the Great Hall of the People in Beijing. The seminar received strong support from the Central People’s Government and was attended by around 380 representatives from over 170 state-owned enterprises and central enterprises. On June 28, 2018, the SAR Government held the third Belt & Road Summit in partnership with the Hong Kong Trade Development Council. The summit was attended by about 5,000 delegates from 55 countries and regions. In November 2017, the SAR Government signed a free trade agreement and a related investment agreement with the 10 member states of the Association of Southeast Asian Nations (ASEAN), which are also along the Belt & Road. Moreover, the SAR Government has been advancing the establishment of the third Hong Kong Economic & Trade Office in ASEAN in Bangkok, Thailand. Since assuming office on July 1, 2017, the Chief Executive has conducted 22 duty visits, including nine visits to Singapore, Thailand, Vietnam, Myanmar, Indonesia, the UK, France, Belgium, Switzerland and Saudi Arabia and 13 visits to Beijing, Tianjin, Shanghai, Hangzhou, Changsha, Chengdu, Boao, as well as Guangzhou, Huizhou, Shenzhen, Zhongshan, Zhuhai and Macau in the Guangdong-Hong Kong-Macao Bay Area. 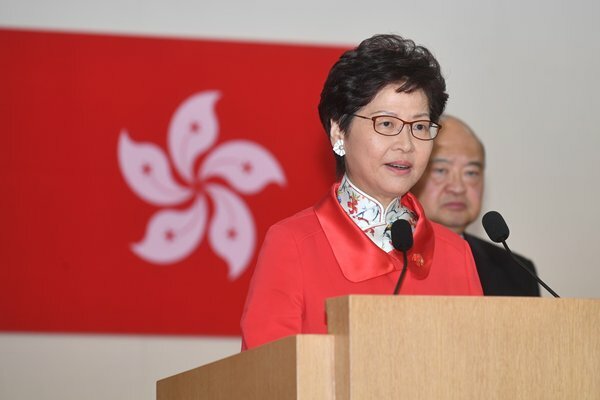 This is a translation of the speech delivered by Chief Executive Carrie Lam at the reception for the 21st anniversary of the Hong Kong Special Administrative Region on July 1.